For you who enjoy visiting places with live animals, animal welfare is probably first of all important. Minimum standards for animal welfare is determined by law for any place displaying live animals. The three most important corner stones of a modern zoo is education, nature conservation and research. However, there are other characteristics of high standard. Here is a handful of suggestions if you want to make a quality check. For Danish zoos the three pieces of information member of DAZA., member of FPDA and quality rating at DTA gives a hint about the quality of the places for animals as well as humans. No double memberships of DAZA and FPDA occur. Besides these indicators, a rating system concerning the accessibility of Danish, public attractions exist. See FTA. In Sweden Svenska Djurparksföreningen (SDF) organizes the zoos ("djurparker"). Norway has no equivalent organization. However, Kristiansand Dyrepark is (as the only Norwegian zoo) a member of the Swedish SDF. 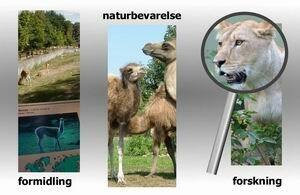 In the presentations of the individual places, their memberships are noted (DAZA, FPDA eller SDF), and for the Danish zoos their rating at DTA (Danish Tourist Attractions) too. Find more about these and other options for checking the quality in the menu to the right. Not all text is translated to your selected language. Contributions from the zoos themselves as well as from the visitors of NordicZoos will be published in their original language only.